Week 7 of the AAF has come and gone, and Johnny Manziel has seen his first action for the Memphis Express. With the crowd in Memphis growing louder, Manziel had a decent debut ... but it was a different Express quarterback who ended up being the hero. Meanwhile, some teams are separating from the pack. The Orlando Apollos got back on the winning track a week after their stunning first loss, and they acted like a team with something to prove Saturday. Steve Spurrier's bunch thumped the Atlanta Legends to improve to 6-1, becoming the first team in the Alliance to clinch a playoff spot. Then, the San Antonio Commanders won a thriller over the Salt Lake Stallions to improve to 5-2. On Sunday, the Arizona Hotshots beat the San Diego Fleet to take sole possession of second place in the West, before the Express kept their playoff hopes alive with a comeback victory. Say what you want about Johnny Manziel, but excitement seems to follow him ... even when he's not playing. 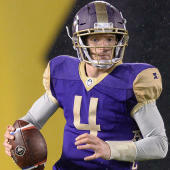 Manziel saw his first AAF action Sunday, but it was the other Express quarterback who wound up being the hero. Brandon Silvers, who started the game and looked pretty solid before Manziel came in for him in the second quarter, returned as Memphis' starter in the fourth quarter. Silvers led the Express to a touchdown with :24 left in regulation, then hit Reece Horn for the two-point conversion to send it to overtime. In the first overtime period in AAF history, the Memphis defense stepped up and held the Iron scoreless after they got the first possession. The Iron were required to go for it on fourth down, as AAF rules don't allow OT field goals. Silvers then found Daniel Williams for the game-winning score. It's not that Manziel is making many plays, yet it's impossible to deny that the Express are surging with him in at quarterback. Memphis blocked a Birmingham punt in the third quarter and Terrell Bonds ran it back for a touchdown. Manziel came in for the two-point conversion, and although his pass to the back corner was caught, it was out of bounds. On the next drive, the Express forced another punt and got a nice return. The Memphis crowd is starting to get loud. Johnny Manziel saw his first action in the AAF in the second quarter and it was nothing if not exciting. Johnny Football completed just one pass, but it was for 36 yards, and he also showed off his scrambling skills. Manziel had two rushes for 20 yards on the drive and helped put the Express in field-goal range, but Austin MacGinnis' 34-yard attempt clanked off the upright. Maybe Johnny Manziel will end up playing, but Brandon Silvers is making a case that he should remain the Memphis Express quarterback, at least for this game. Silvers started the contest 8-of-9 for 100 yards passing, and led the Express to the Iron 2-yard line before Terrence Magee punched it in. However, the Iron retook the lead just 72 seconds later on Trent Richardson's league-leading 10th touchdown run of the season. Luis Perez had gotten the Iron in the end zone first, leading his team on an 11-play, 94-yard drive and capping it off with an 11-yard TD pass to tight end Braedon Bowman for the early lead. John Wolford is having a day in Arizona. In the first half, the Hotshots QB threw for a pair of touchdowns and ran another in, and in the fourth quarter he added a second rushing TD to give him four total on the day. The TD put Arizona in total control, but it was dicey in the third quarter. San Diego had the ball at the Hotshots 2-yard line, but Arizona's defense held. Later, the Fleet missed a long field-goal attempt. But following Wolford's run, the Hotshots picked off Mike Bercovici and hit a field goal to go up by 17 and seal the victory. San Diego needed to get something going to stay in this game, and just before halftime they got it. Quarterback Mike Bercovici found tight end Marcus Baugh, who made a great catch in traffic for a long Fleet TD. One problem: Baugh appeared to toss the ball away before he crossed the goal line, similar to what DeSean Jackson did in 2008 when he played for the Eagles. However, in the live booth review of the call it was decided the TD should stand, and the Hotshots' lead was cut to eight points at the half. The Hotshots picked a great spot to convert on fourth down for the first time all season. On 4th-and-1 from the San Diego 26, John Wolford found tight end Thomas Duarte, who was wide open. And Arizona wasn't done. Deion Holliman made up for fumbling a first-quarter punt by catching Wolford's second passing touchdown (to go with one rushing TD) of the game. Things are not going well for the Fleet right now, as they've given up 17 unanswered points. Arizona forced the San Diego Fleet to punt on the game's first possession, but that's when things went poorly for the Hotshots. Deion Holliman muffed the punt and it was recovered by San Diego's Demetrius Wright at the Arizona 15. Two plays later, Terrell Watson ran it in for the game's first score. The Hotshots came right back with a long drive and a touchdown of their own, capped by an 8-yard run into the end zone by quarterback John Wolford. Only two teams from each division make the playoffs, and with the Commanders now 5-2 after winning four in a row, that means the winner of Sunday's Fleet-Hotshots showdown will be one game back in the West, while the loser will be two back with only three regular-season games left to play. It's a game that carries a lot of weight for both teams -- especially after the Commanders, in front of a record-breaking crowd of 30,345 on Saturday night, stayed the hottest team in the AAF with incredible plays like this one.